Engineered from durable chrome-molybdenum steel and with a polished chrome-plate finish that resists corrosion and easily wipes clean, the convenient flexible ratcheting action of these box-end wrenches makes them indispensable for any project, repair or renovation that needs doing around the home. 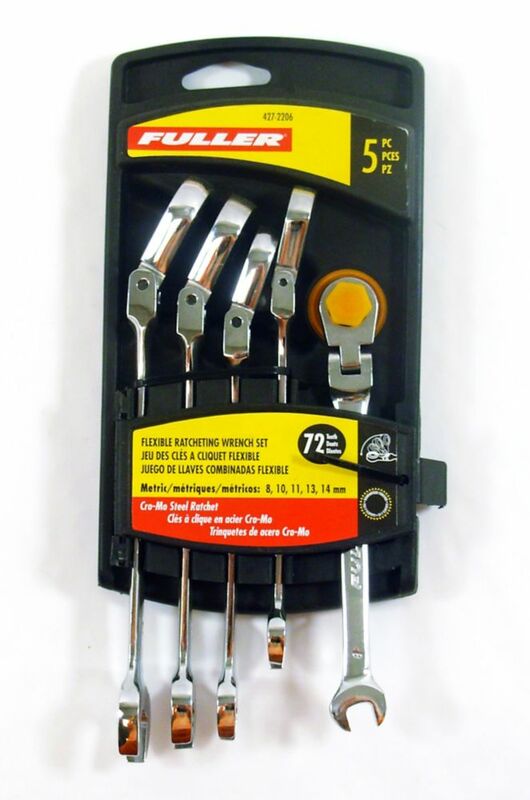 Fuller Tools are guaranteed against defects in workmanship or materials. If a tool fails to perform properly during normal use, not abuse or wear and tear, it will be repaired or replaced free of charge. With its mirrored chrome finish and chrome-vanadium steel construction for strength and durability, this 11-piece SAE combination wrench set not only looks professional, but acts it too: featuring 11 of the most-often used SAE (Imperial) sizes of wrenches, heat-treated materials for hardness, a 12-point box end for precise fit and thin-walled construction that makes working in tight spots easier, these tools were engineered to work hard. This general-purpose selection of the 14 most often used combination wrenches should be a staple in every professional's toolbox. Manufactured from chrome-vanadium steel for strength and durability, and heat treated for hardness, these combination wrenches feature a 12-point box end for close fit, precision machined jaws for sure grip, and are thin-walled for working in snug quarters. For a wide variety of tasks around the house, this 9-piece combination wrench set provides you with everything you need to get the job done right: precision machined jaws for a snug grip, a 12-point box end for exact fit with nuts and bolts, thin-walled construction for easy access in tight spaces, and chrome-vanadium steel for durability and rust resistance. Heat treated for consistent hardness, this multi-purpose combination wrench set is a must for any homeowner who has a to-do list a mile long. The ratcheting wrenches in this 3 piece feature a 25 degree offset which makes them ideal for use on hard to reach or restricted access fasteners. The chrome finish provides excellent protection against corrosion. Made in USA and backed by Gray Tools worry-free lifetime warranty. Metric Wrench Set with Flexible Ratcheting Box End (5-Piece) Engineered from durable chrome-molybdenum steel and with a polished chrome-plate finish that resists corrosion and easily wipes clean, the convenient flexible ratcheting action of these box-end wrenches makes them indispensable for any project, repair or renovation that needs doing around the home.